Angelonia, native to Mexico and the West Indies, is commonly called summer snapdragon due to the appearance of its delicate-looking flowers. 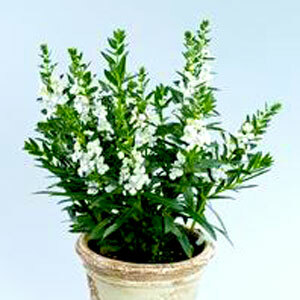 As an annual landscape plant, Angelonia has a tall, upright habit reaching up to 18 inches in height. Full bloom spikes cover the plant, giving it a rich color. The foliage is fragrant, smelling a bit like apples, which makes it excellent for cut flowers since the scent remains, even after being indoors for a while. Angelonia makes a good bedding plant, so your customers may want to use it in borders, but it can also be planted in pots and even window boxes. For best results with Angelonia, we recommend using a constant feed program of 175-225 ppm N. Maintain a pH between 5.8 - 6.2. We recommend that you pinch them 5-10 days after transplanting to your final container. Angelonia can be grown pot tight in 1801s or 4 inch pots, but you may need to spread them out as they reach their final size. While Angelonia are responsive to plant growth regulators, you usually do not need it unless you grow them for an extended period of time and the plant enters a rapid vegetative-growth cycle. Control height through allowing the media to dry slightly between waterings and maintaining lower fertilizer levels. Whiteflies, aphids, and thrips are the biggest pest problems with Angelonia. Alonia Big Snow are not prone to many diseases, but watch for botrytis while the days are short. This grey rot is usually associated with wet or humid conditions. You can prevent botrytis by allowing the plant to dry out between waterings, allowing for good airflow in your greenhouse, and spacing to allow the sun to penetrate to the soil level. The most common chemicals used to treat botrytis are Medallion and Banrot. Use them as a drench according to each label’s instructions. 1. We recommend planting 4-5 starter plants per 10 inch basket. Use a well-drained soil in your baskets and plant your starter plants deep, allowing the ellepot to be completely covered by the soil. If you are planting 4” pots, 1 plant per pot should be sufficient if you have enough time. Plant it directly in the middle of your pot. 2. Pinching is recommended 5-10 days after transplantation.